Update – have even more fun with Hello Hanna paper goods! Hello Hanna really does take the cake when it comes to the finishing touches of party planning. These are products that are kid friendly, fun and not at all difficult, making celebrations bright and cheery for everyone! Remember the gorgeous Hello Hanna pop-up placemats we mentioned earlier in the year? We’re excited to reveal the fantastic Hello Book and set of Sweet Stands are now joining in on the fun. The Hello Book is perfect as a party favour, consisting of a blank accordion fold booklet and five sheets of removable stickers for creating story scenes. You can select from the space-inspired Robot Mission, the dainty Princess Castle or the very cheeky Monkey Business. 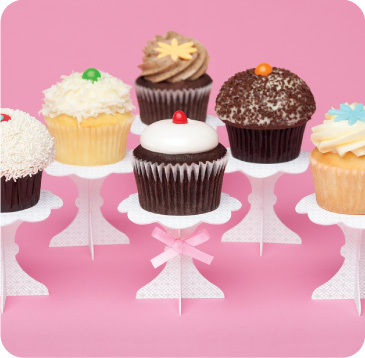 There’s no denying a cupcake is delicious enough on its own but if it’s perched high upon a Sweet Stand pedestal I’d think twice about eating it because it’s so darn pretty to look at. Made from pretty embossed recycled paper, each stand measures 9.5 centimetres tall, perfect for any sweets table at a party! Hello Hanna placemats are now available in Australia from Chic Mother and Baby for $20 a set. 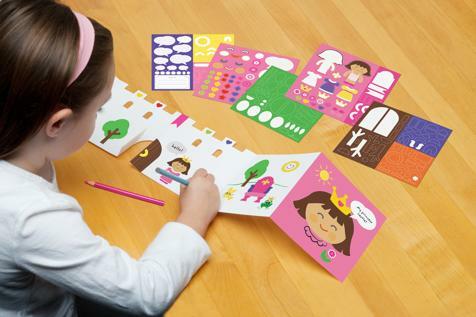 The Hello Books (US$10.95) and Sweet Stands (US$10.95 for a set of six) are not stocked here yet so order direct from Hello Hanna, where delivery to Australia is available.